Search Results for "music class"
In Alumni Hall at Cedar Crest College, students can visit the chapel, attend fine arts class, philosophy class, and music class, in 1954. Male college student plays piano in music class. Wearing grey jacket and playing smooth jazz. 1950s: Abandoned schoolhouse. Children dance on stage during assembly. 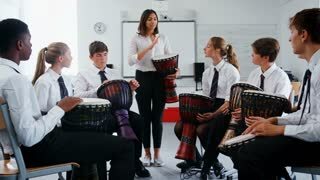 Boy conducts fellow students in music class. Man cleans air conditioner. Boy drinks from milk carton. College students discussing work in music class. UNITED STATES: 1950s: teacher demonstrates science lesson to children. 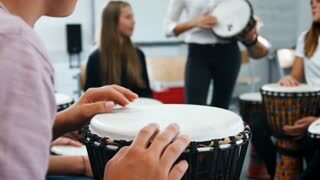 Man plays music in class. Students listen to teacher. United States 1950s. 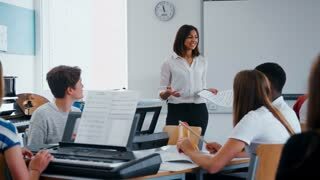 Female music teacher instructs class as they play recorders. United States 1950s. Doctor examines child's throat. Female music teacher instructs class as they play recorders.